» Do you Have Spiritual Caller ID? 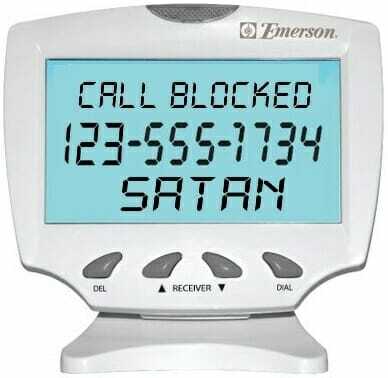 Do you Have Spiritual Caller ID? I love Caller ID. It’s great to see who is calling in advance so you can decide whether you want to take the call or not. Just as you use Caller ID in the natural to screen phone calls, so you should use “Spiritual Caller ID” to screen your thoughts. In the natural, some calls are annoying, distracting, or even destructive with phone scams from thieves who try to steal your money. In the Spiritual, some thoughts are annoying, distracting, or destructive because they come from a thief who wants to steal your life. God showed me that too many of us are taking every “call” that comes into our minds. But we should be selective! When you accept all of these negative calls, they direct your focus away from your Father’s daily business. You also can’t get victory on your Christian weight loss journey! If you have negative thoughts habitually, then you have a mental stronghold. Remain diligent in rejecting these thoughts because when you do it long enough, they will transfer to your ‘Call block’ list automatically! Start using Spiritual Caller ID and you will see things begin to change in your life. P.S. My whole life changed when I chose to believe that God has power to help me with every problem I have – including my weight problem. I dropped from a size 22 to a size 8! Faith starts with believing a word from the Lord. => Click here to reach your ideal weight and live powerfully in Spiritual, soul and body. In our program, you’ll learn Spiritual wisdom related to God’s promises for health and strength so you can gain physical, emotional, and spiritual victory every day on your weight loss journey. Check it out! This is a good one! Love it! As one who LOVES caller ID, this really speaks to me and blesses me! Amen! Thanks. This is great. I will print this and read it daily. May God bless you and your family. You’re a really good teacher, Kimberly. Analogies are powerful tools. This one was excellent. I definitely have a stronghold (plural?) in this area. I cannot comprehend how I got to where I am. I am well into feeling like crap before I ever stop and consider the sheer quantity and depth of the negative thoughts I allow to roam my “house” – as though they “just are” and as though I have no say in the matter. The end result is like a barn yard full of manure piles! And I stand there, scratching my head, shovel in hand, forlorn…wondering how in the world I am going to get this mess cleaned up and how in the world did it get so deep…and how did it become so normal to be so negative!?! The enemy is a deceiver, indeed. Thank you for your many encouragements. Thank you for your servant’s heart and obedience to your calling. Keep putting the truth out there. Some of us need to keep hearing it if there’s any hope for us to turn around / get off the path that leads to death / make life changes that will be God-glorifying. Thank You, Abba – for fanning Kimberly’s flame and giving her words to speak that serve to draw us closer to You. In Jesus’ name…amen. Amen, Angie – thank you for the words of encouragement. I praise God! You know, I think the biggest issue we have is FORGETTING the truths that the Lord has revealed to us. That is why He tells us to mediate on His word day and night. He knows that our memories are very short and subject to deception. I think the biggest issue we have in our Christian walk is FORGETTING the truths that the Lord has revealed to us. That is why He tells us to meditate on His word day and night. He knows that our memories are very short and subject to deception. This reminds me of a story I heard a long time ago: Treasury agents are charged with identifying counterfeit bills and keeping them out of circulation. You would think that their training program would focus on studying the various forms of counterfeit bills, wouldn’t you? Instead, the agents are trained to study the REAL dollar bill. Their goal is to know the dollar bill so intimately that they can spot a fake a mile away. That is how we should be with our minds. Our minds WILL occupy themselves (go to work on something) every day. The question we must always ask ourselves is: What is your mind working on? We are creative beings – just like our Heavenly Daddy. Our minds are creating future results in our lives right now. * Why not put them to work on studying God’s truth rather than the enemy’s lies? * Why not put them to work on making our dreams a reality rather than running from our fears? Let’s mediate on God’s truth so much that when the enemy tries to get us to believe and live a lie, we reject it outright. May we as God’s people commit to living the truth so that we can finally experience the freedom and blessings God has for us!